partly cloudy to cloudy over north west of saudi arabia next week end, heavy rain is expected along this area imcluding maddina and jeddah as well as yanbou. rainy across the mediteranian area on new years eve, tempretures will drop sharply again by next week end through out the middle east. the rest of saudi arabia might see some light rain by the coming friday more to the north and north east along with kuwait. the rest of the gulf still seems to be dry untill the first week of the new year. Happy New Year to all, wishing you rain, snow, and good health. Weather update for the coming New Year ! The weather is looking good for the coming New year, till now we had excellent amount of rain across much of the northern part of the Middle east, Lebanon, Syria and Jordan have already seen the monthly avarage in 4 days of rain. the outlook for the coming few weeks gives more rain to the northern part of the Middle east including Iran to the north east through the end of Dec and the Start of Jan 2011. for the Gulf Area we are still under the control of a high pressure which is limiting the ability of any Law pressure to move in from the north, though some rain can be expected in the western region this week and some light rain is possible these few days across Riyadh and the Eastern Parts of Saudi Arabia, including Bahrain and Qatar. the closest system of heavy rain does not seem to be showing any possibility before the end of Dec 2010 and the start of Jan 2011. Drop of Temp is expected through this week end across the Gulf though not as sharp as last week. Enjoy the weather where ever you are ! Stormy Weather has hit most of the middle east from Turkey north to Egypt south and to the north of Saudi Arabia and Iraq. 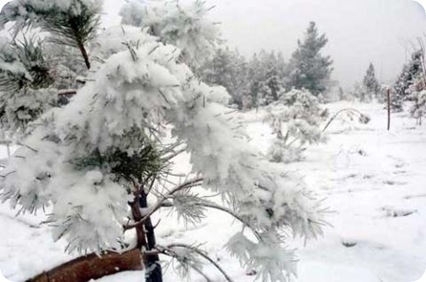 The deep low system that was expected produced drenching rainfall and piles of Snow across Syria , Lebanon and parts of Jordan. This system is moving north east with a very cold front in the upper levels. The system is expected to last further more at least 48 hours, along with this system a cold front is moving south east towards Saudi Arabia and the Gulf States, expect high winds and a sharp drop in temperatures through today and tomorrow, there is also a chance of thunderstorms developing along this cold front over Bahrain , Kuwait, and the eastern province with some showers. Dust storms are also expected so watch out if your driving of very poor visibility today and tomorrow. Weather Warning : Severe Weather expected over the Mediterranean starting Friday. A deep low pressure system is moving south east from north Europe with very low temperatures in upper level atmosphere, this deep low pressure is expected to gradually start affecting the Mediterranean from Cyprus to Syria , Palestine and Lebanon. Severe Weather is expected as well as high winds and thunderstorms, the risk from this storm is the amount of rain that is predicted by the prediction modules, as you can see from the picture in this report, the expectation is exceeding 100 m/m in some parts of Lebanon and Philistine, while the cumulative rain expected is reading at some areas above 200 mm of rain !! this means that flooding from this system is a serious issue and everyone needs to be careful. due to the extreme cold front in the upper level of the atmosphere along with this from Hail storms are also highly likely , so watch out for sudden heavy hail, covering your cars starting Friday night through to Monday night is not a bad idea. this system will also spread across and reach to Jordan as well as Iraq and north of Saudi Arabia, there is also a strong possibility of sudden heavy thunderstorms a across jeddah and Makkah in the coming 48 hours, flooding is always an issue along Jeddah and Makkah area, so caution is advised. this system will start to weaken by Tuesday after noon. if you are able to capture some pictures from the rain of this system in Lebanon or Syria , you can send them to me directly and i will upload them, into the website !! Have a nice Wet weekend !! Lebanon, Syria and palistine Get ready for Heavy Rain!! Finally a cold front is moving towards the middle east and specially lebanon and Syria along with parts of jordan in the coming few days, heavy rain is expected over these areas starting from tomorrow And will continue through out the coming week or two. In simple , winter has started across the middle east finally!! For the rest of the Gulf States things still look dry, and we still don’t expect to see rain any time soon, but atleast the high pressure over us is starting to weaken and this will give space for low pressure systems to cross over. Enjoy the rain lebanon! !